The final casting for the live action adaptation of Disney's "Aladdin" is finally complete and what a way to cap it off by sending out a selfie care of Will Smith himself who will play as the Genie (photo above). Now that casting is complete, production is currently underway at Longcross Studios just outside London. 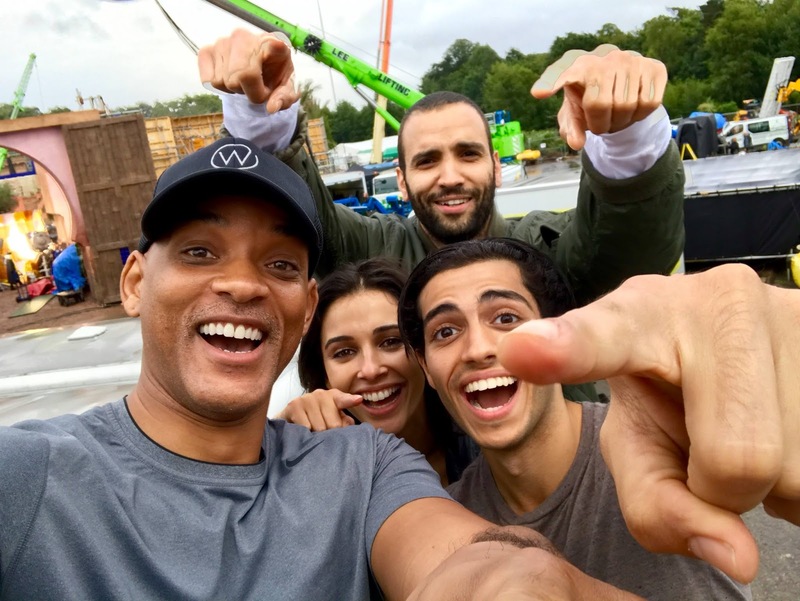 Aside from Will Smith, the other members of the cast are Mena Massoud as Aladdin, the hapless but lovable street rat who is smitten with the Sultan’s daughter; Naomi Scott as Princess Jasmine, the Sultan’s beautiful daughter who wants to have a say in how she lives her life; Marwan Kenzari as Jafar, an evil sorcerer who devises a nefarious plot to unseat the Sultan and rule Agrabah himself; Navid Negahban as the Sultan, the ruler of Agrabah who is eager to find a proper husband for his daughter, Jasmine; Nasim Pedrad as Dalia, Princess Jasmine’s hand maiden and confidante; Billy Magnussen as Prince Anders, a suitor from Skanland and potential husband for Princess Jasmine; and Numan Acar as Hakim, Jafar’s right-hand man and head of the palace guards. “Aladdin” is being directed by Guy Ritchie. The film, as if it needs any introduction, is based on the 1992 animated film “Aladdin” and stories from “One Thousand and One Nights”. Eight-time Academy Award®-winning composer Alan Menken provides the score, which will include new recordings of the original songs written by Menken and Oscar®-winning lyricists Howard Ashman and Tim Rice. An additional two new songs will also be written by Menken and Oscar® and Tony Award®-winning songwriters Benj Pasek and Justin Paul. Disney has yet to unveil the slated release date for "Aladdin" but we will make sure to inform you once we get more information.